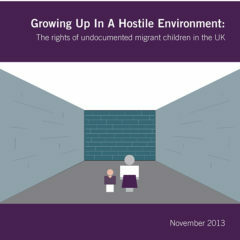 A recent estimate put the number of undocumented migrant children in the UK at 120,000, with over half born here. Many of these children have spent the whole or most of their lives in the UK. This group of children and young people are often unable to access appropriate education, healthcare and support as a result of their immigration status, with many facing extreme poverty. At the same time, they are often unable to either return to their (or their parent/s’) country of origin, or to take the necessary steps to regularise their status, even when they have strong claims for remaining in the UK. These children are trapped in a limbo, unable to regularise their status following the removal of legal aid from immigration cases, a lack of quality legal advice, soaring application fees and poor quality decision-making by the Home Office. Drawing on the work of Coram Children’s Legal Centre through its Migrant Children’s Project advice line, outreach services and legal casework, ‘Growing up in a hostile environment’ examines the ways in which lack of immigration status is an obstacle to children and young people accessing their basic rights and entitlements and the difficulties this group face in obtaining essential legal advice and regularising their status. This circular problem, where ‘unreturnable’ children and young people are left in precarious situations but the current asylum and immigration system does not sufficiently allow for them to resolve their immigration status, is one that must be addressed with great urgency if the UK is to fulfil its legal obligations towards children.